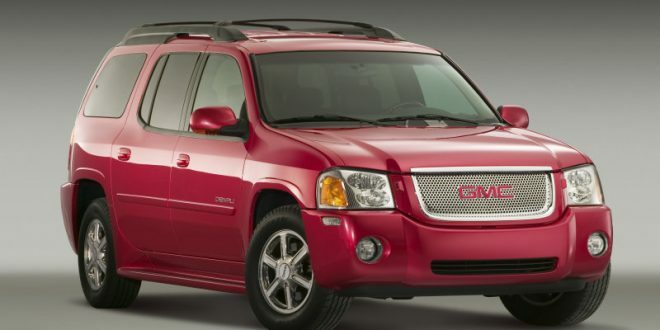 General Motors has renewed a trademark for the Envoy vehicle name, which could suggest the company is planning to bring back the GMC Envoy. The Envoy name was retired when the company ended production of the previous Envoy in 2009. It is worth mentioning that trademark filings are not alway indicative of future products; it’s possible GM is just keeping this name on the shelf to prevent other automakers from utilizing it. The only thing about this particular name is that it coincides with a time in which the SUV boom that gave birth to the Envoy name is back with a vengeance. There’s little doubt GM is working on more crossovers and SUVs to rollout in an effort to satisfy consumer demand. The Envoy badge could bring some homage to GMC showrooms; the original Envoy left with a respectable reputation. So, what could wear the Envoy badge? Some media outlets are speculating that a new Envoy would be a sister vehicle to the all-new Chevrolet Blazer, similar to the original Envoy. However, the new Blazer is effectively the sister vehicle to the GMC Acadia, so that does not seem to make a lot of sense to us. There are a couple other options, though. The Envoy name could rest on a Chevrolet Traverse sized model for GMC, meaning it would be larger than the Acadia. The other option is bringing the Envoy name back on a midsize, body-on-frame SUV based on the same chassis as the GMC Canyon and Chevrolet Colorado. There’s been rumors and speculation in the past that GM may spawn an SUV from that chassis. Regardless, it appears GM may continue the industry trend of bringing back names from yesteryear. One of the great GM mysteries is that, in an age where all things CUV, SUV and truck fly off dealers lots ... And with GM having a dedicated brand to those kinds of vehicles ... Why doesn't GM give GMC unique products to leverage those considerable strengths? Instead, it seems to treat GMC as kind of a truck-Pontiac; a way of getting higher margins off of mildly differentiated Chevrolets. The opportunities for: a Jeep Wrangler/Ford Bronco competitor, a raised wagon all-road vehicle (would the TourX have sold better styled and sold as a GMC? ), a small off-roader like the Jeep Renegade (or the Suzuki Jimmy), a true AWD performance vehicle dedicated to rallying (including the long-travel suspension - see the Safari all things trend), or a Raptor competitor. All would fit well with the GMC brand. What on earth is GM waiting for? If history means anything, they'll try all of the above about 10 years too late (see: Cadillac building better 1990s BMW sedans now and failing in the market). SMH! I keep thinking these same thoughts. There are so many areas GM could delve in to but always a day late and a dollar short or so the saying goes. This isn't the Envoy you are looking for. What's the over/under on something other than fwd/awd based?